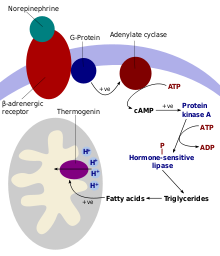 Thermogenin (called uncoupling protein by its discoverers and now known as uncoupling protein 1, or UCP1) is an uncoupling protein found in the mitochondria of brown adipose tissue (BAT). It is used to generate heat by non-shivering thermogenesis, and makes a quantitatively important contribution to countering heat loss in babies which would otherwise occur due to their high surface area-volume ratio. Mechanism of thermogenin activation: In a last step thermogenin inhibition is released through the presence of free fatty acids. The cascade is initiated by binding of norepinephrine to the cells β3-adrenoceptors. UCPs are transmembrane proteins that decrease the proton gradient generated in oxidative phosphorylation. They do this by increasing the permeability of the inner mitochondrial membrane, allowing protons that have been pumped into the intermembrane space to return to the mitochondrial matrix. UCP1-mediated heat generation in brown fat uncouples the respiratory chain, allowing for fast substrate oxidation with a low rate of ATP production. UCP1 is related to other mitochondrial metabolite transporters such as the adenine nucleotide translocator, a proton channel in the mitochondrial inner membrane that permits the translocation of protons from the mitochondrial intermembrane space to the mitochondrial matrix. UCP1 is restricted to brown adipose tissue, where it provides a mechanism for the enormous heat-generating capacity of the tissue. UCP1 is activated in the brown fat cell by fatty acids and inhibited by nucleotides. Fatty acids cause the following signaling cascade: Sympathetic nervous system terminals release Norepinephrine onto a Beta-3 adrenergic receptor on the plasma membrane. This activates adenylyl cyclase, which catalyses the conversion of ATP to cyclic AMP (cAMP). cAMP activates protein kinase A, causing its active C subunits to be freed from its regulatory R subunits. Active protein kinase A, in turn, phosphorylates triacylglycerol lipase, thereby activating it. The lipase converts triacylglycerols into free fatty acids, which activate UCP1, overriding the inhibition caused by purine nucleotides (GDP and ADP). During the termination of thermogenesis, thermogenin is inactivated and residual fatty acids are disposed of through oxidation, allowing the cell to resume its normal energy-conserving state. Uncoupling protein 1 was discovered in 1978 and was first cloned in 1988. Uncoupling protein two (UCP2), a homolog of UCP1, was identified in 1997. UCP2 localizes to a wide variety of tissues, and is thought to be involved in regulating reactive oxygen species (ROS). In the past decade, three additional homologs of UCP1 have been identified, including UCP3, UCP4, and BMCP1 (also known as UCP5). Methods of delivering UCP1 to cells by gene transfer therapy or methods of its upregulation have been an important line of enquiry in research into the treatment of obesity, due to their ability to dissipate excess metabolic stores. ^ "Entrez Gene: UCP1 uncoupling protein 1 (mitochondrial, proton carrier)". ^ Nicholls DG, Bernson VS, Heaton GM (1978). "The identification of the component in the inner membrane of brown adipose tissue mitochondria responsible for regulating energy dissipation". Experientia. Supplementum. 32: 89–93. doi:10.1007/978-3-0348-5559-4_9. PMID 348493. ^ Kozak LP, Britton JH, Kozak UC, Wells JM (Sep 1988). "The mitochondrial uncoupling protein gene. Correlation of exon structure to transmembrane domains". The Journal of Biological Chemistry. 263 (25): 12274–7. PMID 3410843. ^ Bouillaud F, Raimbault S, Ricquier D (Dec 1988). "The gene for rat uncoupling protein: complete sequence, structure of primary transcript and evolutionary relationship between exons". Biochemical and Biophysical Research Communications. 157 (2): 783–92. doi:10.1016/S0006-291X(88)80318-8. PMID 3202878. ^ Kozak LP, Anunciado-Koza R (Dec 2008). "UCP1: its involvement and utility in obesity". International Journal of Obesity. 32 Suppl 7 (Suppl 7): S32–8. doi:10.1038/ijo.2008.236. PMC 2746324. PMID 19136989. Macher, Gabriel; Koehler, Melanie; Rupprecht, Anne; Kreiter, Jürgen; Hinterdorfer, Peter; Pohl, Elena E. (March 2018). "Inhibition of mitochondrial UCP1 and UCP3 by purine nucleotides and phosphate". Biochimica et Biophysica Acta (BBA) - Biomembranes. 1860 (3): 664–672. doi:10.1016/j.bbamem.2017.12.001. Urbánková, Eva; Voltchenko, Anna; Pohl, Peter; Ježek, Petr; Pohl, Elena E. (29 August 2003). "Transport Kinetics of Uncoupling Proteins". Journal of Biological Chemistry. 278 (35): 32497–32500. doi:10.1074/jbc.M303721200. Ricquier D, Bouillaud F (Jan 2000). "The uncoupling protein homologues: UCP1, UCP2, UCP3, StUCP and AtUCP". The Biochemical Journal. 345 Pt 2 (2): 161–79. doi:10.1042/0264-6021:3450161. PMC 1220743. PMID 10620491. Muzzin P (Apr 2002). "The uncoupling proteins". Annales d'Endocrinologie. 63 (2 Pt 1): 106–10. PMID 11994670. Del Mar Gonzalez-Barroso M, Ricquier D, Cassard-Doulcier AM (Oct 2000). "The human uncoupling protein-1 gene (UCP1): present status and perspectives in obesity research". Obesity Reviews. 1 (2): 61–72. doi:10.1046/j.1467-789x.2000.00009.x. PMID 12119988. Cassard AM, Bouillaud F, Mattei MG, Hentz E, Raimbault S, Thomas M, Ricquier D (Jul 1990). "Human uncoupling protein gene: structure, comparison with rat gene, and assignment to the long arm of chromosome 4". Journal of Cellular Biochemistry. 43 (3): 255–64. doi:10.1002/jcb.240430306. PMID 2380264. Bouillaud F, Villarroya F, Hentz E, Raimbault S, Cassard AM, Ricquier D (Jul 1988). "Detection of brown adipose tissue uncoupling protein mRNA in adult patients by a human genomic probe". Clinical Science. 75 (1): 21–7. doi:10.1042/cs0750021. PMID 3165741. Oppert JM, Vohl MC, Chagnon M, Dionne FT, Cassard-Doulcier AM, Ricquier D, Pérusse L, Bouchard C (Aug 1994). "DNA polymorphism in the uncoupling protein (UCP) gene and human body fat". International Journal of Obesity and Related Metabolic Disorders. 18 (8): 526–31. PMID 7951471. Clément K, Ruiz J, Cassard-Doulcier AM, Bouillaud F, Ricquier D, Basdevant A, Guy-Grand B, Froguel P (Dec 1996). "Additive effect of A-->G (-3826) variant of the uncoupling protein gene and the Trp64Arg mutation of the beta 3-adrenergic receptor gene on weight gain in morbid obesity". International Journal of Obesity and Related Metabolic Disorders. 20 (12): 1062–6. PMID 8968850. Schleiff E, Shore GC, Goping IS (Mar 1997). "Human mitochondrial import receptor, Tom20p. Use of glutathione to reveal specific interactions between Tom20-glutathione S-transferase and mitochondrial precursor proteins". FEBS Letters. 404 (2–3): 314–8. doi:10.1016/S0014-5793(97)00145-2. PMID 9119086. Urhammer SA, Fridberg M, Sørensen TI, Echwald SM, Andersen T, Tybjaerg-Hansen A, Clausen JO, Pedersen O (Dec 1997). "Studies of genetic variability of the uncoupling protein 1 gene in Caucasian subjects with juvenile-onset obesity". The Journal of Clinical Endocrinology and Metabolism. 82 (12): 4069–74. doi:10.1210/jc.82.12.4069. PMID 9398715. Jezek P, Urbánková E (Jan 2000). "Specific sequence of motifs of mitochondrial uncoupling proteins". IUBMB Life. 49 (1): 63–70. doi:10.1080/713803586. PMID 10772343. Mori H, Okazawa H, Iwamoto K, Maeda E, Hashiramoto M, Kasuga M (Mar 2001). "A polymorphism in the 5' untranslated region and a Met229-->Leu variant in exon 5 of the human UCP1 gene are associated with susceptibility to type II diabetes mellitus". Diabetologia. 44 (3): 373–6. doi:10.1007/s001250051629. PMID 11317671. Nibbelink M, Moulin K, Arnaud E, Duval C, Pénicaud L, Casteilla L (Dec 2001). "Brown fat UCP1 is specifically expressed in uterine longitudinal smooth muscle cells". The Journal of Biological Chemistry. 276 (50): 47291–5. doi:10.1074/jbc.M105658200. PMID 11572862. Echtay KS, Roussel D, St-Pierre J, Jekabsons MB, Cadenas S, Stuart JA, Harper JA, Roebuck SJ, Morrison A, Pickering S, Clapham JC, Brand MD (Jan 2002). "Superoxide activates mitochondrial uncoupling proteins". Nature. 415 (6867): 96–9. doi:10.1038/415096a. PMID 11780125. Rousset S, del Mar Gonzalez-Barroso M, Gelly C, Pecqueur C, Bouillaud F, Ricquier D, Cassard-Doulcier AM (May 2002). "A new polymorphic site located in the human UCP1 gene controls the in vitro binding of CREB-like factor". International Journal of Obesity and Related Metabolic Disorders. 26 (5): 735–8. doi:10.1038/sj.ijo.0801973. PMID 12032762. Rim JS, Kozak LP (Sep 2002). "Regulatory motifs for CREB-binding protein and Nfe2l2 transcription factors in the upstream enhancer of the mitochondrial uncoupling protein 1 gene". The Journal of Biological Chemistry. 277 (37): 34589–600. doi:10.1074/jbc.M108866200. PMID 12084707. Kieć-Wilk B, Wybrańska I, Malczewska-Malec M, Leszczyńska-Gołabek L, Partyka L, Niedbał S, Jabrocka A, Dembińska-Kieć A (Sep 2002). "Correlation of the -3826A >G polymorphism in the promoter of the uncoupling protein 1 gene with obesity and metabolic disorders in obese families from southern Poland". Journal of Physiology and Pharmacology. 53 (3): 477–90. PMID 12375583. This page was last edited on 29 October 2018, at 12:03 (UTC).